For fans of the new LEGO The Batman Movie, DK have published a handful of fun and informative books. 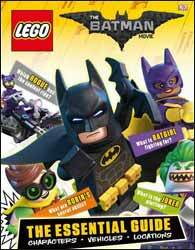 LEGO The Batman Movie The Essential Guide is a 68-page hardback release that packs quite a lot into its pages. Like the LEGO movies, this book has tongue placed firmly in cheek, as it explores the light and humorous side of the Batman universe. It also gives us a look at the some of the LEGO Batman minifigures including Glam Rocker Batman (which includes an electric guitar), Vacation Batman (complete with goggles and rubber ring); and the pink Fairy Batmother (equipped with tutu, wings and magic wand). For those wanting to see what LEGO kits are available, there's also a nice collection including the vehicles, and playsets - although I doubt the giant Wayne Manor and Arkham Asylum are actually real kits you can buy. The book also runs us through the villains, including the weird and wacky ones like Orca and March Harriet. And provides more facts and amusing information than any one mind can handle. It's a beautifully presented book which will keep young fans engrossed for hours.